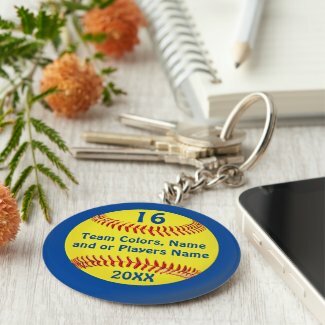 Personalized softball party Ideas, supplies and gifts. Free Design Service to customize your softball party supplies and gifts. Call Linda to create your custom softball party ideas, senior night party supplies and gifts. You (or call Linda) can Change the background and text COLORS to any colors on most of my softball party supplies and gifts. The girls softball team will love seeing their name and jersey number on these softball party favors, softball favor bags boxes and cheap softball gifts for players and softball coaches. Invitations, Stickers and Softball Favors! Get the party started with these great softball party ideas! 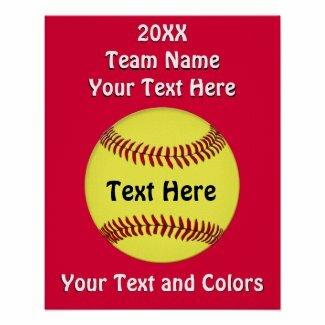 A cool multi-colored Softball Birthday card or an Invitation that features your Text and/or Jersey number! Click on the cards above for personalizing your special invitations. Discount rates apply! More Great Softball Party Ideas! Click on Poster to get your Softball Party started! Your Message of Congratulations or Happy Birthday is perfect for your Softball Party! Text of your choice, plus the option of changing the background colors! Click on Poster above, and then click “Customize” for easy to follow steps! Softball Stickers in BULK or buy 1 Sheet! Click on Softball stickers! Customize with your Name or Team Name, Year or Jersey number! Different shapes and size options. Each sheet of 20 will have the same text. You can order multiple sheets with different text and receive a progressive discount for orders of two sheets or more. Click on the sticker above to see details of customizing and info on quantity discounts! Check out the wrapping paper that can even be personalized! Your name and jersey number or “Congratulations” would look pretty cool! For more Goodie Gift Wraps and Boxes, Click on the Softball Gift Bag! Goodie bag with Player’s name and Number, Year, even the Team Name or School ~ or your choice of TEXT! Discounts for quantities of 10! Background can be changed ~ for an endless palette, click on the eyedropper! Different sizes available, and glossy or matte. Click on bag and see the customizing options! Keepsake Personalized Softball Buttons, 1 or in BULK ! One of the best deals for Softball favors! No minimum order, order just one button with your player’s Name or Team Name or your choice of text! Square button is an option, with a background color behind the softball. Choice of five sizes, the smallest size less than $3, largest, colossal size less than $7. Save Even More!Discounts add up ~ Save 25% on orders of 10 buttons, 35% on orders of 50. Discount figured on total number ordered, even if each button is customized with a different name and number. Just add to the cart after each customization. Should you need help with anything or to request a custom order at no extra charge, please call Bev to help you, 239-949-9090. Click on Hair Ties with Jersey Number for less than $3! Even greater savings of 15% discount applied to orders of three or more. Customize and add to cart; total number customized applies to discount! Many thanks to Vince Lombardi! For great ideas and thrills about Girls Softball, visit Softball is for Girls! Softball drills, safety in playing the game, the ups and downs, and a great feature is Spotlight on a Player or Team! The spotlight here is on a player diagnosed with Type 1 Diabetes and still running cross-country and track and winning, traveling with her softball team before and after her diagnosis, all the while adjusting to a new school year and a embracing a regimen to keep her healthy and going strong. Of course her terrific spirit is quite an inspiration! What a drive and determination to fight and win! More info on the blog, plus sign up to have your girls softball player or team possibly put into the Spotlight! Looking for More Great Gifts for Your Softball Player? Check out our Collection of Girls Softball iPhone Cases! And take a look at our one-of-a-kind Customizable Girls Softball Pillow and Blanket Collection! We specialize in creating memories that will last a lifetime! We specialize in unique gifts that will be treasured and memories to last a lifeime! For more great gifts that can be personalized and customized, visit our Zazzle store! Excellent printing and 100% customer satisfaction! Zazzle takes care of its customers and we take pride in what we do. Personal assistance to customize your order, so you will create that special keepsake! Visit our customizing and personalizing shop! We offer many different sport ideas and treasures, sure to please that fan or number 1 player in your life! Even young girls softball gifts such as softball keychains will be loved by them because they will be so proud to put them on their softball backpacks or softball bags.